Elena Rojas takes her responsibility as the heir to and guardian of the El Tepeyac Café legacy very seriously. Because it came from her late father—the legendary Manuel Rojas—she feels blessed, she says, by the opportunity to extend the hospitality, the warmth and the comfort El Tepeyac and its signature menu have come to represent for a legion of diners from at least three generations and several countries. Dressed in a short-sleeved, white Mexican blouse, jeans and sensible slip-on shoes, she has accented her standard “uniform” with holiday accessories. Around her neck and on her wrist, miniature Christmas ornaments and silver bells adorned with tiny ribbons and bows announce her movements as she navigates the crowded restaurant floor. Her eyes gleam with a contagious joy that mirrors the smile she breaks into as she greets old and new customers alike, making sure they being attended adequately. The self-described “crazy lady” finally takes a seat and immediately offers to feed a guest. “Would you like guacamole… chips, salsa?” she asks. Tucking strands of wavy, still mostly brunette hair that have broken loose behind her ear, her face takes a thoughtful turn. The holidays are a perfect time, Rojas says, to reflect on her life as the storybook princess who now presides gently over business and service at the classic East Side eatery. “I’m really not used to this,” says the youngish grandmother of seven. In the blink of an eye, she goes from confident matriarch at the helm of a Boyle Heights cultural mainstay with a stature rivaled perhaps only by Mariachi Plaza, to sweet neighborhood girl next door. Raised in the restaurant, Rojas is the personification of the love and goodwill her widely admired father and her more behind the scenes mother maintained for one another well beyond the seven years Rojas says their informal union lasted. The pair still did their best, she says, to prepare her for a destiny she has tried to embrace with the grace and dignity it deserves. To most, El Tepeyac is the home of the Hollenbeck Burrito and its gluttonous, five-pound sibling, the colossal Manuel’s Special, a burrito so big it was featured on cable’s Man vs. Food TV series. Foodies from around the globe continue to test their mettle with attempts to singlehandedly consume one for bragging rights and a commemorative t-shirt. A more select group of restaurant regulars, neighbors and Catholic parishioners from throughout the hemisphere, however, know “El Tepeyac” as the name of the hill-top in Mexico City where the “Virgen de Guadalupe” is said to have appeared to an Indian named Juan Diego. Mexico’s patron saint, the Virgin of Guadalupe occupies a hallowed space on the wall inside the restaurant opened and christened in her honor over 60 years ago by Elena’s paternal grandfather, Salvador Hernández Rojas. “My grandfather named it Tepeyac because it was on a hill,” says Rojas of the familiar Evergreen Ave. location acquired by her grandfather in the mid-1950s. When he passed away in 1958, she adds, her grandmother, Rebeca Solis Hernández Rojas, asked her son Manuel to come help her run the place. “My father had already tried opening three [of his own] restaurants. But they had all flopped. Once he came on board here, the rest is history,” Rojas says. Her earliest memories of the restaurant feature her father asking her to sit quietly at the famed lunch counter. Pointing to her, he would announce to patrons that if anyone was interested in a pretty little Indian girl, he just happened to have one on special that day. “After I was born, my mom and dad split up, but my mom would bring me here every weekend. Sometimes he would let me wait on tables and keep the tips,” she recalls. At 15, Rojas and about a dozen of her friends from Our Lady of Loretto High School all applied for stock girl jobs at a department store located at Broadway Plaza downtown. Surprisingly, they were all hired, Rojas recounts. Over the next few weeks, many of them stopped coming to work because of pressure from parents or boyfriends. “Little by little, the girls started dropping. I was one of the ones that stood,” Rojas explains. “Right before they were going to promote me to the floor, not as a salesgirl, but with the displays, my father told my mom that I couldn’t work there anymore because I was coming home at 9pm on the bus alone from downtown,” she continues. Concerned for her safety, he simply hired her himself. Her parents had already been apart for some time by then, Rojas explains. Her mother had even accepted a marriage proposal resulting in a brief move to North Hollywood for her and her child during Elena’s grade school years. 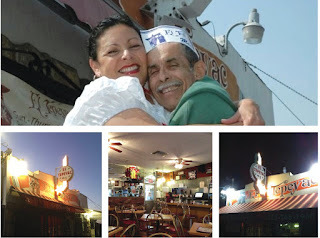 Shortly after Elena began work at El Tepeyac, she was joined by her mother, who—after parting ways with politely the North Hollywood husband—had been invited by Manuel himself to consider coming back to Boyle Heights. With his daughter and her mom, a beautiful, petite woman named Mercedes who everyone knew as “Mercy,” set up together in Boyle Heights and El Tepeyac in the capable hands of his former love, Manuel settled into his role as the charming crowd pleaser and incorrigible flirt, the persona behind a Mexican diner which was already much more than just a place to eat. And so it remains, Elena Rojas declares. As a hub for neighborhood news, a meeting place for political leaders as well as long-lost schoolmate and an honorary hall for family reunions, El Tepeyac derived much of its notoriety from Manuel’s beaming, good-natured generosity and playful demeanor. Her father, says Rojas, was also a philanthropist, sponsoring sports teams and schools, often helping out family, friends or neighborhood organizations in need with quiet discretion. If her mother was the organizational wizard who kept the many cogs and wheels running smoothly, Manuel was the heart and soul that powered the enterprise, opening up the kitchen each day at 3am, on his feet for long hours cooking, serving or greeting customers relentlessly. With a kiss on the cheek for the women and warm hugs for the boys, he was like the honorary mayor of Boyle Heights. A former lightweight division boxer, he was the perfect poster boy for the bootstrap, rags to riches story, the come-from-behind little guy with the right kinds of ganas and gumption. His success could be claimed by everyone, and because it was built upon one order of beans and rice at a time in an era when Boyle Heights was much more racially mixed, it resonated across differences based on religion, language, heritage or creed. “He would always make sure you got something to eat, even if you didn’t have any money,” Rojas recounts. “Everybody loved him.” When her mother became ill with cancer in the early 1990s, he did not hesitate to move her into the front part of his home on the same block as the restaurant. “He moved into the back part of the house and started taking care of her. He would bathe her, dress her, brush her hair… everything, He used to tell me, ‘Your mom’s a helluva woman.’ Then she had to go back to the hospital,” Rojas says, pursing her lips to hold back a sudden tide of emotion. “But I’m like my father. I don’t have time to be sad, or mad or upset. This is the place where people have always come to feel better, to see friends they haven’t run into for years, to have a shot with my dad, hear a joke or remember those they’ve lost,” she says, pausing the interview for a moment to visit with her own daughter who asks for leave to pick up a sick child at school. “The funny thing is after mom left, my dad and I sat down. We looked at each other and said, ‘What are we going to do now?’” On the administrative end of things, the business suffered, Rojas confides. About eight year into the new millennium, she and her father agreed to hire a relative eager to them as a manager. 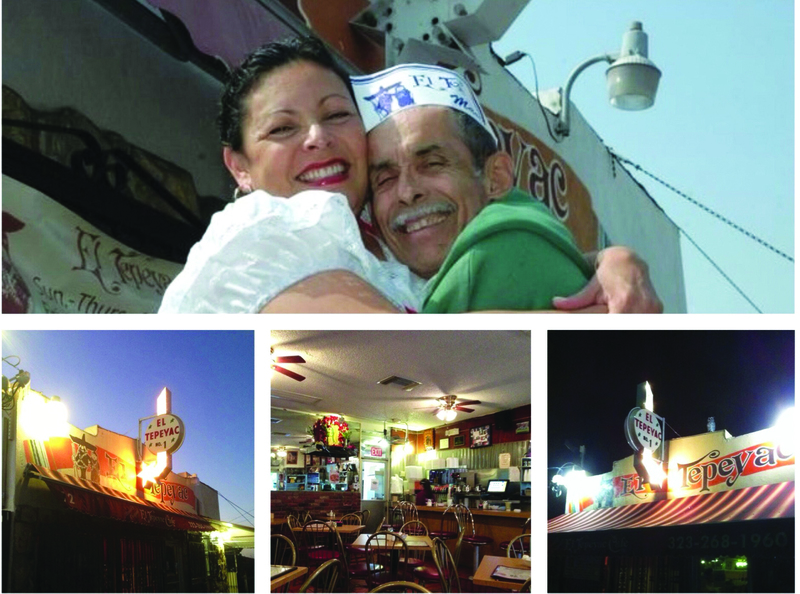 Elena remained, of course, to support her father and oversee the day-to-day logistical operations while gradually assuming Manuel’s place as the link between the original El Tepeyac—along with all it symbolized as a significant part of LA’s historical lore—and the uncertain long-term future of the business and an expansion neither she nor her father were truly excited about. In 2013, at 79, Manuel finally took his leave. His passing was accompanied by a mass outpouring of sympathy and widespread acknowledgement for his many contributions to the East Side as both a revered role model and a fundraiser for countless worthy causes. The line for the public rosary, says Rojas, was about two blocks long. “I didn’t cry,” she says. Instead, she waited stoically as mourners and well-wishers came to offer condolences. “I must have stood there for about two hours.” For her, it is enough to hear an elderly African American gentleman say upon a recent visit that her father had just spoken to him and insisted he visit the restaurant immediately or to share her own birthday celebration as she did this summer with “Mama,” an Asian woman who was born exactly 43-years ahead of her. “She turned 100 on July 1st, the same day I was turned 57!” she exclaims in disbelief. She and her colleagues on Evergreen Ave. are no longer associated with the relative brought on board a short five years before her father’s death or his recent efforts to dilute the company brand with an independently-owned and operated expansion. She worries that, without oversight and at least some legal protection, her father, his life and his legacy will get turned into a franchise-style, amusement park carnival ride complete with cartoon caricatures and stereotypes. She is content to keep the El Tepeyac vision and mission as close to the ground and authentic as she can. She knows how much her father’s dream was tied directly to the heartbeat of Boyle Heights, a rhythm evident in his step as he darted from table to counter to table pouring those secret shots of tequila for his guests as they waited for their plates.